I am so excited to finally get started on this blog! Ideas have been swarming around in my head for weeks about things Id like to write about. I even started making a list until Dave could get this site up and running for me. Unfortunately, when it came time to actually sit myself down and write this first post, I experienced what I can only imagine is some bizarre form of bloggers stage fright which upon reflection is pretty pathetic since my readership is zero at the moment. Before I get to my other first for the day, let me tell you a little about what I hope to do with this blog. I have been following the advice of Mark Sisson of Marks Daily Apple (albeit with a few jumps and starts since the beginning of 2009. Initially I just wanted to look thinner. I had been lifting weights for a little while at that point and although I was getting stronger, I was frustrated that I wasnt losing more fat. I was researching this problem online when I stumbled across The Primal Blueprint. It is a little hard to imagine now, but at that time I still held this irrational attachment to bread and pasta. I couldn’t imagine eliminating them from my diet. So, I started with small changes. I decided I would only eat grains at one meal a day instead of three. Once I started eating more closely to how humans evolved to eat I started losing fat at a much faster rate. As a bonus, I started noticing all sorts of other side effects. Most noticeably I had a lot more energy. I realize that having more energy sounds like a tired clich when describing the effects of a diet but I dont know how else to put it. It started to get easier to fit my workouts into my day because I had the energy and desire to do them. Although I hardly recognized it at the time, I used to spend most of my time feeling pretty sluggish. Now my body craves a physical challenge and I actually have fun doing hard physical work in the yard, or taking an impromptu run along a path in the woods. Even more surprisingly, I started to feel happier. I wouldn’t describe myself as unhappy before, but I certainly did not experience the enthusiasm for the day that I do now. Don’t get me wrong, I still have my moments, but am much less prone to feeling overwhelmed by normal life events or else bored by the routine. I also used to get really grumpy and irrational whenever I had to wait too long eat. This doesnt happen anymore. Even if I skip a meal, I feel fine. Hunger is no longer an emergency. Eventually I stopped focusing so much on fat loss and become more motivated by the health benefits of primal eating. 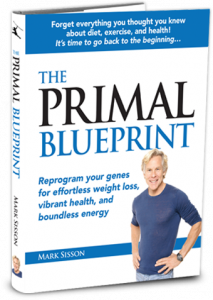 Although I am still losing fat, The Primal Blueprint has become a guide for how I approach other aspects of my life too. I have re-evaluated how I exercise, play, handle stress, and prioritize the most important parts of my life. I hope that through this blog I can help spread the message of The Primal Blueprint while also sharing my experience of implementing its principles in my everyday life. Now on to the green smoothie. Im not sure why it took me so long to find out about these. 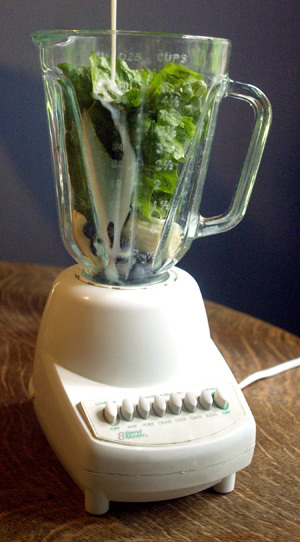 Maybe its because I dont tend to make smoothies very often, but it never would have occurred to me on my own to put kale in my smoothie. Smoothies have traditionally been little more than a medium for whey protein in my life as I prefer to eat my food than drink it but green smoothies are going to be a great way to incorporate more of my CSA greens into my diet this summer. I dont know about you, but when I think snack I rarely think spinach. Until now! I was anticipating something slightly bitter or salad-y but this drink was light and refreshing. Dave pointed out that you probably cant go wrong as long as you throw in some banana but if you dont want the added carbs, I think the almond milk gave it all the sweetness it needed. Green smoothie variations are endless. This one was pretty tame but I plan to incorporate some more exotic ingredients in smoothies to come. Your smoothie does not sound to inviting, but I’m will to trying anything once. 🙂 I’ll let you know how it goes. I started reading Mark’s site over a year ago, but I was very reluctant to give up my grains, too. I started experimenting with primal breakfasts and lunches, then started having more and more primal dinners. It wasn’t until this challenge came around that I finally decided to just try giving up grains entirely – and I’m really amazed at how great I feel. This smoothie sounds great! I’m very excited to have found your blog! Hi Shelley. I found out about your wonderful blog from your contest entries over on marksdailyapple.com. I am new to all this, so your site (as well as Mark’s) is like a wonderland to me. I’ll definitely be trying out some of the recipes you’ve posted and using your links to make my purchases. Love your kitchen with all the serene plants. Thanks for all the new ideas. Wishing you the best and hope you keep it up. I am convinced real food is one of the most important things you can do for yourself and your family. This way of eating will be the norm for you kids and they won’t have to kick a carb/sugar addiction like the rest of us.